When we were at Jason's sister's place in the country last July, my mother and I made a trip to the Morehouse Merino store. When she caught me staring longingly at the Pinnacle Poncho kit she asked if I wanted one. I told her that I'd always wanted one, but I wanted it in the colorway shown in the picture. Unfortunately, when I discovered the poncho pattern at Rhinebeck the year before, they didn't have that colorway at their stalls at the fairgrounds or at their store. "You mean like this?" she said, holding up a kit with the perfect colorway match. She bought it for me as a "honeymoon present" under the condition that I not start knitting it until the honeymoon. And so began three more months of gazing longingly at it, this time in the comfort of my own home. Needless to say, it was the first thing I started knitting on the honeymoon. 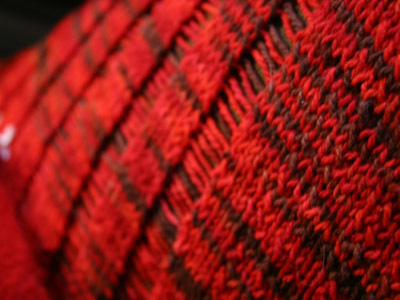 It was speedy knitting -- worsted weight yarn on US11s goes pretty quickly! I finished up on the train between Seville and Madrid, and slipped it on in our hotel room as soon as we checked in. It was an important knitting moment, the culmination of over a year of lusting after this poncho. Given the buildup, I should have known better. It looked B.A.D. on me. Too long, not flattering around the neck, too much fabric over the arms. Yuck. Not wanting to pollute my good honeymoon mood with hateful thoughts toward a knitted object, I quickly shoved it to the bottom of my knitting bag and didn't think about it for the rest of the trip. What a great pattern! We're flying off to Cali tonight and this is coming with me on the plane. Have a great weekend! Enjoy your time in California. 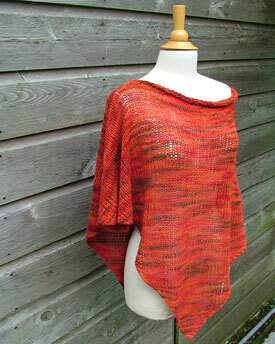 Too bad about the poncho, but it will make a beautiful Clapotis. I love the colorway, so vibrant!